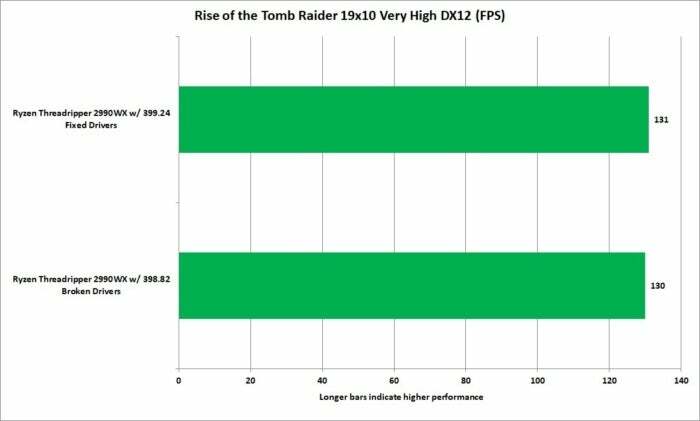 A bug in Nvidia's drivers drastically hurt the 32-core Threadripper 2990WX's performance. When we reviewed AMD's CPU Colossus, the 32-core Threadripper 2990WX, it had one weakness: gaming. But it looks like the fault lay with Nvidia, not AMD, as a driver update appears to fix the problem. 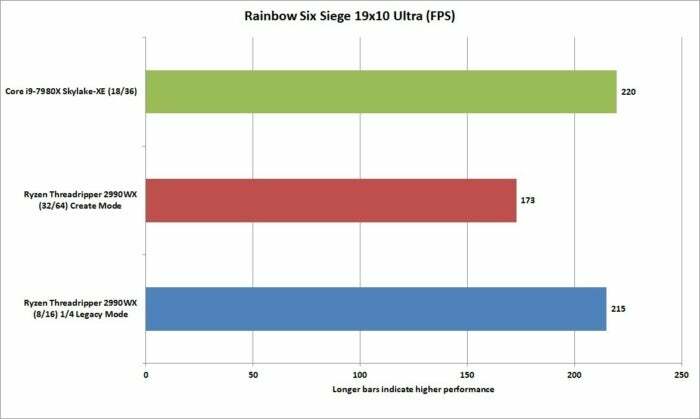 PCPer.com testing broke the news, finding significant increases in performance in several games with the updated drivers. “Almost every title we tested saw some sort of frame rate increase, up to 78% for the most improved title, F1 2017,” wrote PCPer’s Ken Addison on the new drivers. 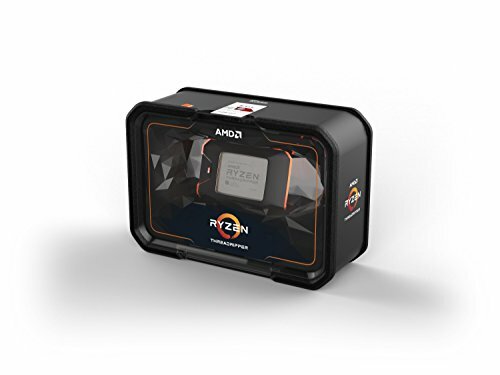 We didn’t delve heavily into game performance when we tested the 2nd Gen Threadripper. We figured most people who'd plunk down $1,800 for a work CPU weren’t going to care much about its performance in games. Still, such a development deserves a second look, so we fired up our Threadripper testbed and updated its GeForce GTX 1080 with the 399.24 driver. Our original test driver was 398.82, released about August 1, just a few days before we began our review of the Threadripper. We ran two games with the CPU set to Legacy Mode, where it switches off three dies (8 cores), and then Create Mode, with all four dies on (32 cores). The original results showed that in Legacy Mode (8 cores), performance was about on a par with the Core i9-7980XE, but in Create Mode (32 cores) performance dropped. Our original review of the Threadripper 2990WX with the busted 398.82 driver. With the new driver in place, performance takes a nice step forward and is, frankly, right there with the Threadripper’s score when set to legacy mode. Nvidia’s latest drivers fix gaming performance on AMD’s burly 32-core Threadripper CPU. Our experience with Rise of the Tomb Raider was rather confusing, though. 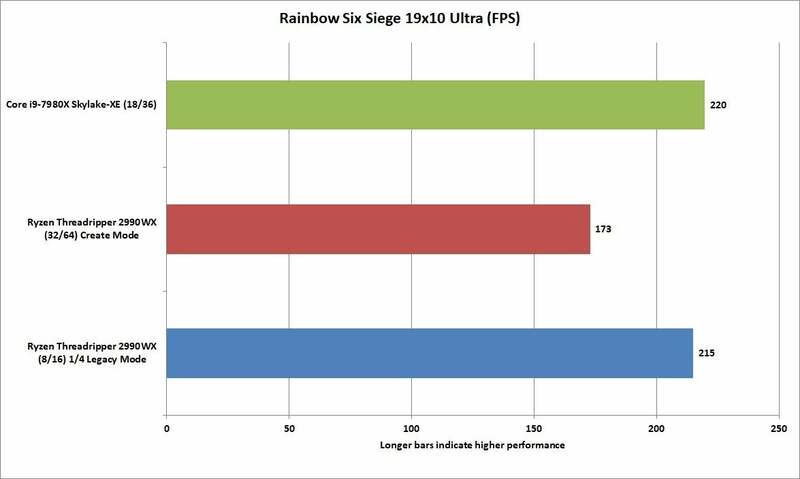 First, here are the results of the game from the original review, with the broken 398.82 driver. Performance basically was on point in Legacy Mode, with three of four cores turned off. With all 32 cores running, performance goes off a cliff. For our test with the new driver, we first ran Rise of the Tomb Raider with the 398.82 driver and secured a score of 88.3 fps—just a hair off the original score. On our second run, the system threw up a Blue Screen of Death (BSoD), which is the first time we’ve had that occur on the Threadripper 2990WX during testing. 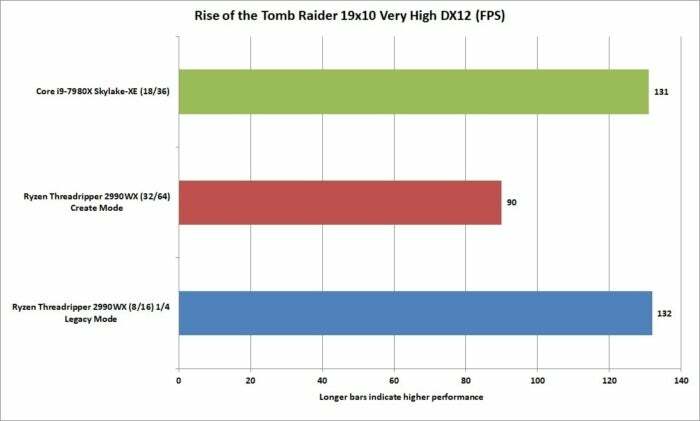 Upon restart, we ran Rise of the Tomb Raider with the broken 398.82 drivers still in place. Rather than the 90-fps range we saw previously, it was was running in the 130-fps range. An average of three runs, in fact, was 130 fps. The score with the fixed 399.24 drivers was 131. I simply can’t explain why it was suddenly performing faster after a BSoD. Oddly, we didn’t see an uptick with Rise of the Tomb Raider, but our experience was pretty odd. This is good news for the 32-core Threadripper 2990WX CPU, but it doesn’t change my opinion much. For someone who intends to play games 90 percent of the time, there are better options simply because they’re cheaper. 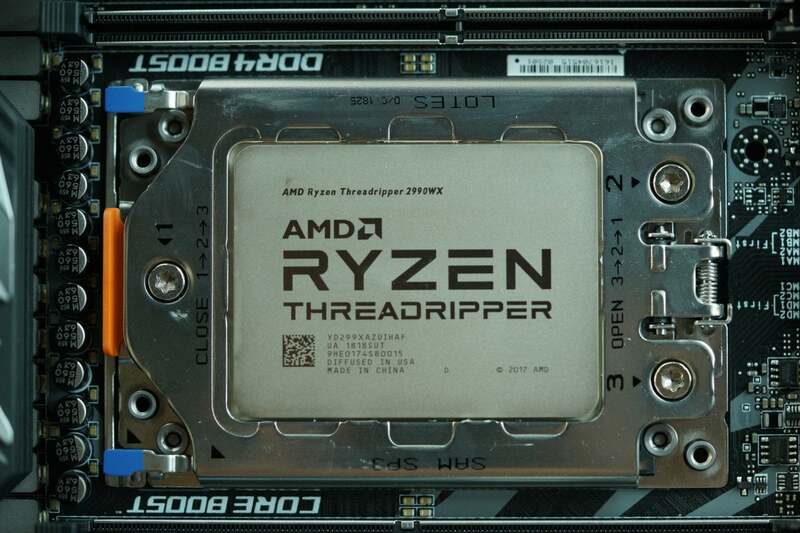 For someone, however, who intends to render video or heavily multi-task 90 percent of the time, and fire up a game or two at night, the 32-core Threadripper is the CPU to beat today. 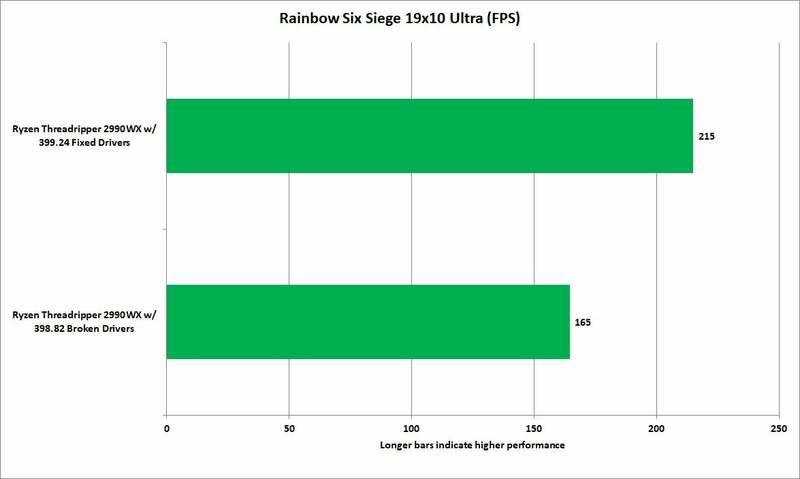 And if we no longer need to reboot into legacy mode to hit higher frame rates, all the better.